The ancient Greeks banned it, but we�re playing it anyway! Start Time: Saturday June 7 from 5-6 PM. Come early at 4:30 PM if you want to learn the history of the lost sport and pick up super sneaky game strategies! Location: Meet between 4:30 and 5 PM at the fountain at the Columbus Circle Entrance to Central Park. Note: The game will be played for one hour at a secret hidden location - you must arrive by 5 PM to come with us! # of players: It takes 12 to play, but we want as many as possible, 100 or more! 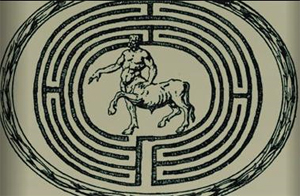 2000 years ago, the ancient Greeks played a game they called simply "The Labyrinth." Until recently, little has been known about the mysterious sport - only that it required the athletes to be blindfolded, and that eventually it was banned from their Olympics games. Now, the rules for the labyrinth have been rediscovered - and for the first time in modern history, the world will learn to play the Labyrinth again. You don�t need to be an athlete to master this lost sport - it mostly requires trust, courage, and collaboration. 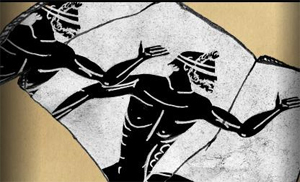 Come learn the sport and participate in a labyrinth race - or just come to watch as The Lost Sport of Olympia is rediscovered in New York City! Come play, or just watch, as the blindfolded labyrinth game known as "the Lost Sport' is rediscovered in New York City. We�ll blindfold you and teach you the rules. Once you�re initiated into the secrets of the human labyrinth, Team New York City will be virtually racing against other teams who are training in New Zealand, Buenos Aires, San Francisco, Sao Paolo, Zurich, Madrid, London, and more. Learn more about the history of the lost sport at www.thelostgames.com. Jane McGonigal discovered the ancient "Lost Sport" in San Francisco in 2008, while doing research for an Olympics-themed alternate reality game The Lost Ring (with AKQA, www.thelostring.com). Her previous projects include Cruel 2 B Kind (with Ian Bogost, www.cruel2bkind.com), World Without Oil (with Ken Eklund and ITVS, www.worldwithoutoil.com), and Tombstone Hold �Em (with 42 Entertainment). She also creates games from the future with the Institute for the Future in Palo Alto, which will be launching a new public forecasting game called Superstruct in early fall 2008. Jane earned her PhD making and studying games, and she created Avant Game (www.avantgame.com) in 2003 to promote experimental game design for public places and everyday life. PLAY RAIN OR SHINE! WE HAVE A SECRET WEATHER-DEFIANT LOCATION WHERE YOU WILL BE DRY!